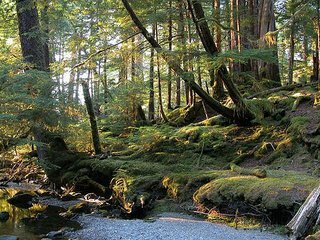 My parents just returned from the Haida Guaii, otherwise known as the Queen Charlotte Islands, where they were picking wild mushrooms for mad cash. The Charlottes are located 300 km of the northwest coast of British Columbia and are a day’s trip from my parents place in New Hazelton. Sometimes called the Galapagos of the North, I have fond memories of that wild, lush place: BC’s own little tropics, it seemed to me. I know these little chanterelle beauties (called giroles in French) from my three years at Toque! where I probably cooked enough of them to crust the entire Island of Montreal in a nice duxelles. 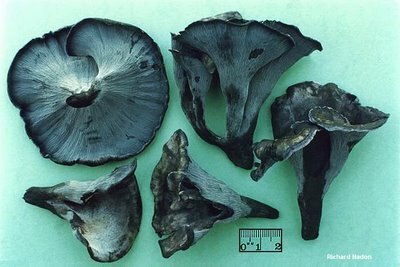 We received more than just the one mushroom variety from the QC’s, there were morels, black trumpets and the infamous pine, too. The Montreal mushroom scene is pretty weird. It is mostly controlled by one family of Eastern European decent (don’t know where for sure) who are all in competition with each other. With my parents having picked them, and I having served them, it seems like we have had a mushroom ‘full circle’ moment, as Oprah would say. Ok, maybe we should reserve that term for something a little more monumental, but I though it was pretty cool. Crazy story about the mushroom guy too - I laughed out loud. I love the Queen Charlottes! I want to take Zaak and fam there someday. My parents did mushrooms too, but many years ago and I was still a baby. Mom says they were pretty potent and she didn't enjoy them that much. I think maybe Serge has done shrooms too. Eh Serge? Hi Aimée! nice story about the mushrooms! my mouth was salivating while reading about you cooking the Chanterelles. I end up in your blog because I am thinking about travelling to the Queen Charlotte to visit for the first time the Islands and maybe to pick some mushrooms too. Do you know when does the season start? Could you give me any advice?